A lot has happened over the years in the 7 square kilometres that make up Gibraltar. 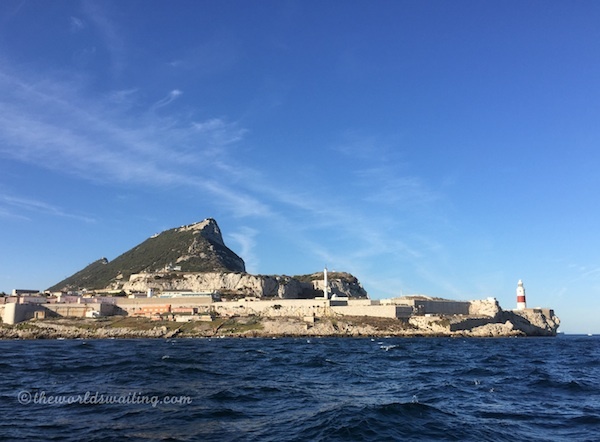 Originally settled by the Moors, then conquered by the Spanish and later becoming a British Overseas Territory, Gibraltar has seen many conflicts and the country today is a fascinating mix of several influences. There are lots of things to see, and the good news for those short on time is that everything is very close together. Having first visited Gibraltar as a child, I can guarantee a visit to see the Gibraltar rock apes will create lifelong memories. It was great to revisit recently and see the apes continuing to thrive on top of the Rock. The evidence of Gibraltar’s turbulent history is also bound to inspire young imaginations. The endless cannons seemed to excite my brother. Almost as famous as the rock itself, Gibraltar’s characterful rock apes rule the nature reserve on top of the rock (and a few pop down to the bottom to say hello too!) At the top station there are photo panels introducing individual members of the troop of Barbary Macaques, but there are several more to meet. The apes stroll around their visitors, casually sizing them up to determine if they have any food worth stealing. Plastic bags seem to attract attention, beware! At just over 400 metres tall, climbing up to the top of the Rock of Gibraltar is not for the feint hearted. Fortunately two cable cars carry visitors to the top, from which it is a pleasure to stroll back down. Road surfaced paths lead up to the top, but are very steep in places. Thought to be around 195 million years old, St Michael’s Cave is a large cave in the Gibraltar Nature Reserve. 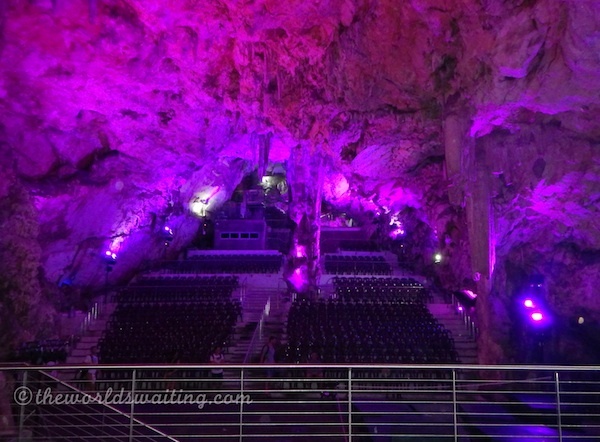 The cave is so large it contains tiered seating and concerts are held inside. The cave boasts spectacular limestone stalactites and stalagmites, all illuminated in changing colours that almost give the impression of movement. There are two tunnel networks that run through the Rock of Gibraltar. The first, and higher, tunnels are those of the Great Siege of Gibraltar in 1779 - 1783. A main tunnel leads through the rock to several significant chambers, and eventually through to the other side of the Rock. Apparently there was a time when 16,000 people lived inside this tunnel network. Today it contains information about the construction and purpose of the tunnels, and waxworks to bring history to life. Further down the Rock, tunnels developed during the Second World War can also be visited. While the exhibitions in the tunnels focus on the military angle, the City Under Siege exhibition explains what life was life for regular inhabitants of the City of Gibraltar. It explores what food was available to locals, what punishments were enforced to criminals and grisly, but thought-provoking, information about disease and death. Waxworks and information panels are placed in and around ruined buildings, making the siege uncomfortably ‘real’. Little remains of the Moorish Castle that stood at the base of the Rock of Gibraltar in Medieval times, and which was originally much larger. The high fortress tower remains and from the top of the tower some of the nearby city walls can also be seen, but little else remains. Within the tower structure there is a room that was thought to be a muslim prayer room, and then changed to a chapel by captors. During times of conflict when a bell rang it signalled the population should flee to the safety of the castle. It is questionable just how safe it was however, as there was little food available and, holding so many, the castle became rife with disease. 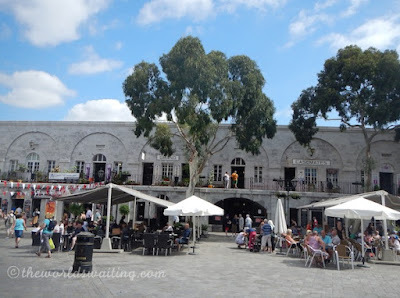 At the base of the north-western side of the Rock is Gibraltar’s Old Town, occupying the area which the castle used to encompass. Branching south-west from a large square, narrow streets weave among historic buildings (often flanked by cannons), several monuments and lots of duty free shops, making it an interesting place to stroll. Britain’s influence is very clear in town. Several large British chain stores such as Mothercare and Marks and Spencers line the main street in Gibraltar, and there is even a British Home Stores. Since Gibraltar is not part of the European Union goods are sold free of VAT, but some Gibraltar taxes can apply. Being outside the EU also means you can buy antibiotics in the pharmacy without a prescription, which is very handy if you know what is wrong with you. Old-fashioned British street signs are in place around town (the black signs with brass / gold edging), and traditional red Victorian post boxes can be seen too. 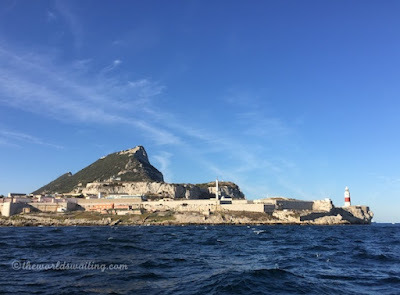 Despite Gibraltar having long been a thorn in Spain’s side (as Spain considers it to be part of Spain’s territory), it is very simple to cross the land border from Spain but, while it feels just like Europe, it is important to remember passports. If you take a pet you will also need to take their pet passport. Gibraltar uses Gibraltar pounds. They have the same value as British pounds, but will not be accepted back in Britain, so use up as much of the local currency as you can before leaving. 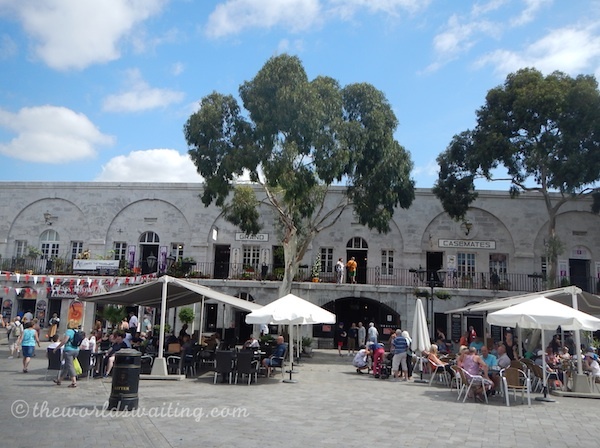 Have you been to Gibraltar? Is there anything you would add to this list?